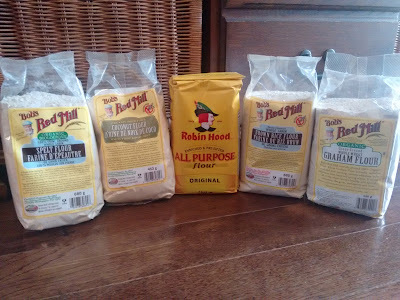 Simon and Anna bought me a bouquet of flours for Christmas. I'm definitely more into flours than flowers. One of the flours is Bob's Red Mill Stone Ground Whole Wheat Graham Flour. I'd never baked with graham flour before, but it makes an awesome cookie! These cookies are a cross between a lightly sweet graham cracker and a dense peanut butter cookie. 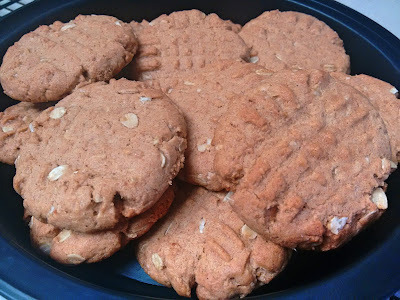 Simon isn't a fan of traditional peanut butter cookies, but he loved these! My oven runs hot, so I baked these at 325°F for 10 minutes, but you might have to bake at 350°F, depending on your oven. Note: I minimized the sugar content as much as possible, so if you like a sweeter cookie, add another 1/4 cup of honey to this. The sweetness level of the recipe is about the same as a honey graham cracker. In a large bowl, combine flours, oats, salt, baking soda and cinnamon. Mix until uniform. In a second bowl, combine peanut butter, coconut oil, brown sugar, honey, vanilla and egg. Use a hand mixer to blend until smooth and thick consistency is reached. Add flour slowly and mix with hand mixer again until combined. Preheat oven to 325°F. Line a baking sheet with aluminum foil. Spray with canola oil. Roll dough into 1 inch diameter balls, place on baking sheet evenly spaced apart, then use the back of a fork to flatten cookies to just under 1/2 inch thick. Bake for 9-10 minutes. Allow cookies to cool on baking sheet for 3 minutes, then transfer to a cooling rack.